One of the best summer traditions is to get the whole family together and go to the park on a summer evening for a band concert. 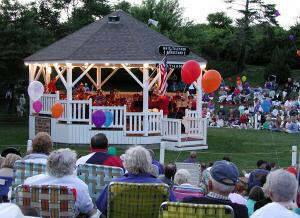 Whether you have never gone to a Chatham band concert, or you and your family have been enjoying the performances for years, this year is as good a year as any to go and see a band concert in Kate Gould Park (just behind the Wayside Inn at 512 Main Street). The concerts are held every Friday during the summer. The concerts start at 8pm and go for about an hour and a half, although the concerts are occasionally canceled if the weather is too bad. The concerts are a storied tradition in Chatham, dating back to 1932, and they have grown in popularity since then. Consider grabbing dinner in Chatham before the concert, or bringing a picnic with you. And of course, be sure to bring lawn chairs or blankets. It is also wise to dress in pants and bring a long-sleeved shirt, as much to protect yourself from the bugs as from the chill in the night air.